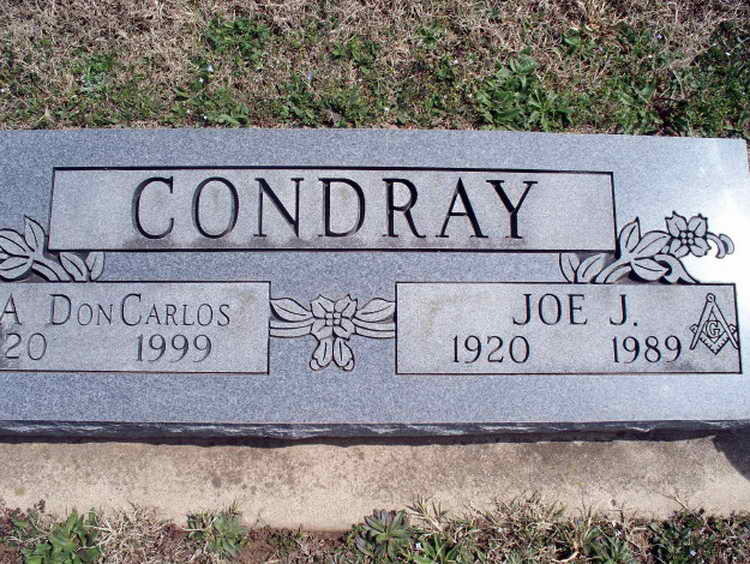 Grave marker for Joe J. and Ina (Don Carlos) Condray in the Robbins Cemetery, Coffeyville (Montgomery county), Kansas. Joe enlisted in Tulsa, OK on 13 October 1942 and was assigned to Hq 1st, 508th. He completed basic training at Camp Blanding, FL and jump school at Fort Benning, GA. While the regiment was at Camp Mackall, NC Joe was sent to the Oliver General Hospital, Augusta, GA. After three weeks hospitalization he was given an honorable discharge due to an undisclosed disability encountered in the line of duty.